Amber Monroe, a 2016 Georgia Southern University graduate who earned a B.S. in biology, settled into the dramatic landscapes of Iceland earlier this year to pursue graduate research and fulfill a childhood dream. The following year she applied to the master’s program at Hólar University College in northern Iceland. Accepted into the program, Monroe began her graduate studies in May and is currently conducting research in the field of aquaculture. Her experiments are designed to better understand the growth and metabolism of lumpfish, economically important coldwater fish that help control sea lice (a parasitic crustacean) in aquaculture facilities where fish are raised. Monroe says there aren’t many differences between her new home campus and Georgia Southern’s Statesboro campus, but one of the biggest is class size. 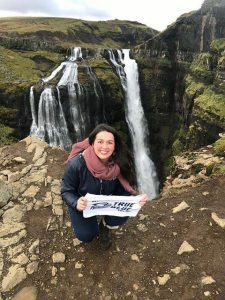 Although Monroe is attempting to learn Icelandic, her program at Hólar is internationally diverse. “It’s fairly normal to be sitting at the lunch table and hear conversations in English, Icelandic, French, Dutch and German,” said Monroe. Attending a small college on a sparsely populated island means that life is “more laid back” than in the U.S., and Monroe finds that socializing with fellow students to stay active is important. As a Georgia native Monroe says that the snow flurries aren’t what’s making her nervous about the approaching winter season.